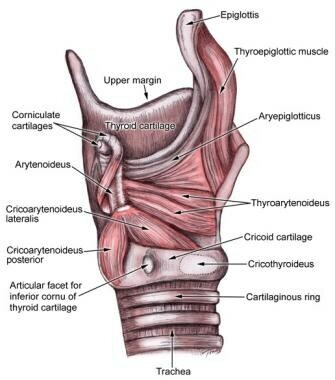 Illustration of the larynx, posterior view. Cerebrovascular accident is the third leading cause of death in developed countries, with a prevalence of approximately 5% in persons aged 65 years or older. Laryngeal manifestations of stroke play a significant role in the morbidity and mortality of stroke, via both direct and indirect mechanisms (see Mechanisms of laryngeal symptoms in stroke in Laryngeal Anatomy and Embryology). Accordingly, the effects of stroke on this finely balanced yet inherently precarious system manifest as deficits in swallowing, breathing, and communicating. Phylogenetically, the primary function of the larynx is to prevent, via sphincteric control, aspiration of foreign material into the tracheobronchial tree. To do this, the human larynx contains 7 intrinsic adductors (compared with only 1 abductor) and 7 extrinsic laryngeal elevators (compared with only 4 depressors). Similarly, the airway protection functions of the larynx are involuntary, whereas the respiratory and phonatory functions are voluntary, albeit modulated by complex involuntary cortical feedback loops. According to Negus, as early amphibians began to transition from an aquatic environment to land, increasing respiratory requirements favored the evolution of sphincter dilator muscles and cartilaginous structures to support them. Endowed with both abductors and adductors, the larynx is able to close during swallowing, coughing, and tasks requiring increased intrathoracic pressure. Just as importantly, the larynx opens before respiration and subtly regulates the breathing cycle. Despite the presence of the requisite functional elements, the primitive larynx provided no phonation. Negus described phonation as the least phylogenetically significant function, noting that, of all mammals, only humans have the ability to produce complex sounds. [2, 3] However, the human larynx has several anatomic characteristics that facilitate phonation at the expense of airway protection and respiratory regulation. The larynx is a complex mucosal-lined structure composed of 9 distinct cartilage components connected by membranes, ligaments, and muscles, which separate the pharynx from the trachea (see the following images). The larynx is derived from the fourth and sixth branchial arches. At the fourth week of fetal development, the laryngotracheal groove forms and subsequently invaginates to form the laryngotracheal diverticulum, thus dividing the primitive foregut into dorsal and ventral portions. Epithelial proliferation lateral to the laryngeal orifice then obliterates the lumen until recanalization occurs by the 10th week of gestation. In contrast to the other branchial arch derivatives, the cartilages of the fourth and sixth arches develop from the lateral plate mesoderm rather than the neural crest of the midbrain and hindbrain. Development of the larynx begins during the fifth week of gestation, as mesodermal condensations called arytenoid swellings begin to form within the sixth arch. The arytenoid cartilage is formed by the seventh week of gestation, followed by the cuneiform and corniculate, at approximately the same time as the thyroid and cricoid cartilage. In contrast to the early development of the remainder of the larynx, chondrification of the epiglottis, which develops at the location of the fourth arch, does not occur until the fifth month of gestation. The epiglottis may be derived from cells that have migrated to the location of the fourth arch from the hypobranchial eminence, although some investigators have reported mesodermal swellings within the arch that undergo chondrification after the remainder of the larynx does. The hyoid bone is derived from the second and third arches. With the exception of the cricothyroid, which is derived from the fourth arch, the intrinsic musculature of the larynx is derived from the paraxial mesoderm of the first and second occipital somites (see the images below). Additional muscles involved in phonation and deglutition are derived from the first arch (mylohyoid, anterior belly of the digastric, tensor veli palatine), second arch (posterior belly of the digastric, stylohyoid), third arch (stylopharyngeus), and fourth arch (pharyngeal constrictors, levator veli palatine). Illustration of the intrinsic muscles of the larynx, superior view. Illustration of the intrinsic muscles of the larynx. Illustration of the intrinsic muscles of the larynx, sagittal view. The superior laryngeal and recurrent laryngeal branches of the vagus nerve are derived from the fourth and sixth branchial arches, respectively. 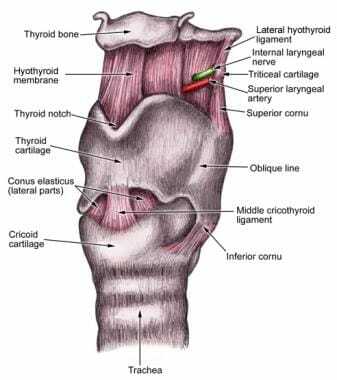 The epiglottis, thyroid cartilage, and cricoid cartilage are the 3 midline cartilaginous structures that make up the laryngeal framework (see the following images). Superiorly, the laryngeal framework is associated with the hyoid bone, which does not articulate with the larynx. Posteriorly, the paired arytenoid, corniculate, and cuneiform cartilages are supported by the midline cartilages. The arytenoid cartilages articulate inferiorly with the cricoid lamina, whereas the corniculate and cuneiform cartilages rest above the arytenoids, within the aryepiglottic fold. 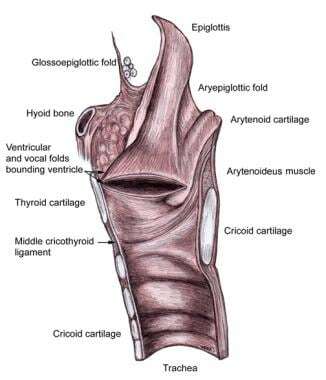 Motion of the larynx occurs via the cricothyroid and the cricoarytenoid synovial joints. 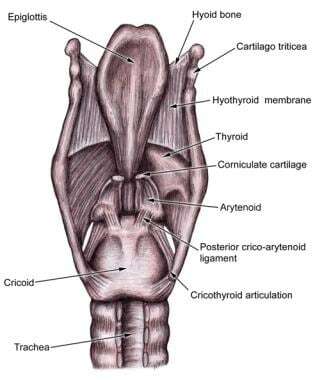 The cricothyroid joint rotates along a common transverse axis between the inferior horns of the thyroid cartilage and the posterolateral aspect of the cricoid cartilage. The rocking motion of this joint changes the distance between the anterior aspect of the thyroid cartilage and the anterior cricoid cartilage, thereby stretching and adducting the vocal folds. The cricoarytenoid joint is located between the cricoid lamina and the broad base of the pyramidal-shaped arytenoid cartilage. This joint has 3 degrees of freedom, which include sliding (medially and laterally), rotating (medially and laterally), and tilting (anteriorly and posteriorly). 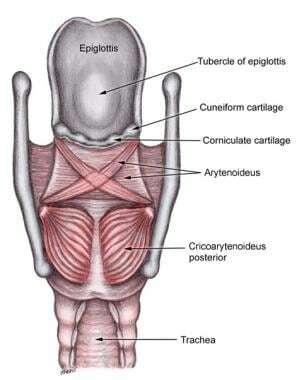 The posterior cricoarytenoid abducts the true vocal fold (TVF). The cricothyroid stretches (lengthens) and adducts the TVF. The lateral cricoarytenoid adducts the TVF. The transverse arytenoids adduct the TVF. The oblique arytenoids adduct the TVF. The thyroarytenoid tightens the TVF. The vocalis shortens the TVF. The extrinsic suprahyoid muscles (stylohyoid, mylohyoid, geniohyoid, digastric) elevate the larynx. 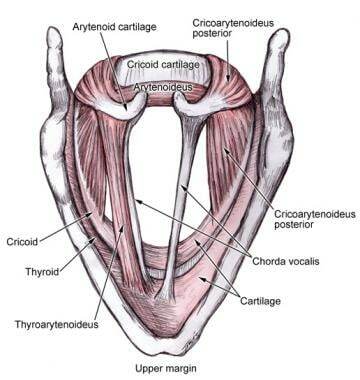 The extrinsic infrahyoid muscles (sternohyoid, sternothyroid, thyrohyoid, omohyoid) depress the larynx. See the image below. Illustration of the extrinsic muscle insertions of the larynx. The high position of the larynx in infants (and in many mammals) places the epiglottis in contact with the soft palate, affording some degree of separation between the airway and the digestive tract. By age 6 months, the human larynx has descended to its relatively low position. Despite this modification, both the epiglottis and the aryepiglottic folds continue to prevent the penetration of foreign material into the airway. The true and false vocal folds function as paired one-way valves. The downward-turned false vocal folds, coupled with the air-trapping ventricles and saccules, prevent escape of air from the lower respiratory tract when adducted, while providing little resistance to inspired air. Conversely, the adducted true vocal folds have been shown to obstruct inhalation but not exhalation. The superior laryngeal nerve (SLN) branches from the vagus just below the nodose ganglion and then divides into separate motor and sensory branches. The internal branch traverses the thyrohyoid membrane and provides sensation to the laryngeal surface of the epiglottis and to the larynx. The basic arrangement of the sensory innervation of the SLN is that the anterior branches innervate the laryngeal surface of the epiglottis; the middle branches, the supraglottis above the vestibule; and the posterior branches, the posterior arytenoid/hypopharynx/caudal vocal fold. The external branch descends with the inferior constrictor to provide motor innervation to the cricothyroid muscle. Most evidence suggests multiple cortical, subcortical, midbrain, and brainstem connections between the motor cortex and the nucleus ambiguous. Stimulation of these subcortical regions produces nonverbal phonation associated with states of emotional arousal. The periaqueductal gray plays an especially important role in the coordination of cortical and subcortical inputs, with complete mutism resulting from ablative lesions in this region. Although the dominant hemisphere is responsible for speech production, the nondominant hemisphere modulates the inflection, intonation, and timing of speech. The cerebellum may also have a modulatory role. Upper motor neuron laryngeal manifestations include spastic paresis, decreased agility (cerebrum); resting tremor, dystonia, and rigidity (basal ganglia); and intention tremor and dysdiadokinesis (cerebellum). Lower motor neuron laryngeal manifestations include atrophy and flaccid paresis or paralysis. Laryngeal manifestations of stroke play a significant role in the morbidity and mortality of stroke, via both direct and indirect mechanisms (see the table below). Therefore, the otolaryngologist is an important contributor to the multidisciplinary team of specialists required to successfully manage the sequelae of stroke in both the short- and long-term rehabilitative stages of treatment. The patient’s voice should be assessed while he or she is counting and reading a passage of balanced vowels and consonants, such as the "Rainbow passage" (balanced consonants and vowels) or the Marvin Williams passage (includes all voiced sounds). Attention should be paid to the voice’s fluidity (fluid or nonfluid), articulation (clear or indistinct), and the voice quality (normal or raspy, breathy, strained, hypernasal, hyponasal). Depending on the location, acuity, and severity of the stroke, every parameter of voice characteristics may or may not be affected. Marvin Williams is only nine. Marvin lives with his mother on Monroe Avenue in Vernon Valley. Marvin loves all movies, even eerie ones with evil villains in them. Whenever a new movie is in the area, Marvin is usually an early arrival. Nearly every evening Marvin is in row one, along the aisle. Involuntary motion of the vocal folds, including tremor, myoclonus, and spasm, should be identified. Laryngeal tremor is characterized by involuntary rhythmic movements of the vocal folds during rest and during phonation (see Laryngeal Tremor). In contrast to tremor, myoclonus is characterized by the abrupt, nonrhythmic nature of the movements, although slow (4-6 Hz) rhythmic movements may also be observed. Laryngeal myoclonus may be accompanied by myoclonus of other neck structures, referred to as branchial or oculopalatal myoclonus. The pathophysiology of this movement disorder has been localized to the dento-olivary pathway. Dysphagia and aspiration are factors that significantly affect the morbidity, mortality, and cost of care for patients who have experienced a stroke. [15, 16, 17, 18, 20] Patients with laryngeal manifestations of stroke may have decreased sensation, impaired motor function, and decreased laryngeal cough reflex. Comorbid deficits in tongue, pharyngeal, and esophageal function further increase the risk of aspiration. Videofluoroscopic evaluation of patients who have had an acute stroke has revealed aspiration in 20-70% of patients. Dysphagia, sedative medications, and witnessed aspiration are associated with the development of pneumonia. Aspiration pneumonia has an estimated mortality of 20-65%. The early treatment of patients with dysphagia via a multidisciplinary approach that includes a speech-language pathologist is associated with improved outcomes. Clinical swallowing examination (CSE), cough reflex testing, fiberoptic endoscopic evaluation of swallowing (FEES),  and videofluoroscopic swallow evaluation (VSE) are tools that are available for assessing aspiration risk. CSE typically consists of identifying risk factors for aspiration (ie, dysphonia, dysarthria, abnormal gag reflex, abnormal volitional cough, cough after swallow, voice change after swallow). Cough reflex testing uses aerosolized or nebulized tussigenic compounds to stimulate a reflexive cough. FEES consists of endoscopic examination of the pharynx and larynx during administration of liquid, puree, and solid-food boluses dyed with food coloring to enhance visualization. The endoscopist notes evidence of penetration and aspiration. Similarly, VSE enables visualization of penetration and aspiration based on real-time radiographic imaging of the pharynx and larynx during swallowing attempts with liquids and solids of varying consistency. Patients with cough, pneumonia, or both and conditions that place them at high risk for aspiration should be referred for CSE. Self-reported and family-reported symptoms of dysphagia should be evaluated with CSE. Volitional cough is not a reliable marker of aspiration. Reflexive cough and volitional cough have not been validated as reliable risks of aspiration. Patients with dysphagia should undergo FEES or VSE. FEES and VSE are useful for determining compensatory strategies for safe swallowing. The ACCP, American Gastroenterological Association (AGA), and the American Speech Language and Hearing Association (ASHA) uniformly advocate a multidisciplinary approach to dysphagia. The US Agency for Healthcare Research and Quality (AHRQ) has reported that screening programs for patients who have experienced acute stroke followed by referrals to dysphagia specialists dramatically reduces the rate of aspiration pneumonia. Management approaches depend on the degree of dysphagia and the comorbid conditions. The risk of aspiration has been demonstrated to decrease with time after stroke. To meet short-term nutritional requirements in patients with significantly decreased mental status or severe dysphagia, nasogastric tube feeding may be indicated. Epistaxis and increased gastroesophageal or laryngopharyngeal reflux should be kept in mind as possible complications of this therapy. For long-term, nonoral feeding, a gastrostomy tube should be considered. In patients with dysphagia and intact mental status, dysphagia therapy focuses on techniques to minimize aspiration by increasing anterior laryngeal excursion, the opening of the upper esophageal sphincter, and the pharyngeal clearance. Use of postural maneuvers, different delivery methods (spoon vs cup vs straw), and the alteration of food consistency are other components of dysphagia therapy that may reduce or eliminate aspiration. Targeted physiologic swallowing exercise programs, electromyographic biofeedback, and electrical stimulation of the extrinsic laryngeal muscles have also been shown to reduce aspiration in small studies. [27, 28] Use of angiotensin-converting enzyme inhibitors to reduce aspiration via a substance P–mediated mechanism has been described,  although correlation with FEES or VSE has not been performed. A novel form of treatment is paced glottic closure for controlling aspiration pneumonia. This involves surgical placement of a stimulator on the ipsilateral recurrent laryngeal nerve. Pulses effect closure of the glottis for airway protection. One small study showed statistically significant improvement in vocal fold adduction and decreased rates of pneumonia in 2 of 3 patients with brainstem/basal ganglia/cerebellar stroke who received paced glottic closure treatment. While these results are promising, further clinical evidence is needed prior to widespread adoption. For a more comprehensive review of the surgical treatment of chronic aspiration and dysphagia please see the article entitled " Surgical Management of Chronic Aspiration." Patients who develop unilateral vocal fold paresis may be asymptomatic if the vocal fold is in the median or paramedian position. Paralysis with lateral vocal fold position manifests primarily in aspiration and dysphonia. Evaluation of immobile vocal folds typically includes flexible fiberoptic laryngoscopy and computed tomography (CT) scanning or magnetic resonance imaging (MRI) of the complete course of the recurrent laryngeal nerves but may also include direct laryngoscopy and palpation of the cricoarytenoid joints, as well as laryngeal electromyography (LEMG). Common examination findings in vocal fold paralysis include vocal fold atrophy and anteromedial displacement of the affected arytenoid cartilage, with subsequent foreshortening and inferior displacement of the true vocal fold. In the rare case of bilateral vocal fold paralysis, urgent tracheostomy may be necessary. Posterior laser cordotomy, arytenoidectomy, and suture lateralization of the arytenoid cartilage are 3 surgical options available to attempt decannulation. Each of these procedures is used in an attempt to provide an adequate posterior glottic airway, with continued anterior glottic closure for phonation. Recovery from vascular insult to the motor innervation of the larynx is similar to that of other CVA motor deficits (ie, earlier improvement portends a more rapid and complete recovery). Clinical consequences of vocal fold paralysis may range from none (asymptomatic) to airway obstruction that requires urgent tracheostomy. Additional testing may be warranted in patients who experience significant dysphonia as a sequela of stroke. In fact, because supranuclear lesions may result in dysphonia without obvious vocal fold paralysis, additional testing modalities are necessary for proper diagnosis. Although dysphonia must be differentiated from pure dysarthria, aphasia, or dyspraxia, phonatory dysfunction (frequently resulting from presbylarynx) is very common as a comorbid condition in patients with dysarthria. Dysphonia, therefore, plays an additive role in the communication impairment of patients who have experienced stroke. Videostroboscopy is a critical component of the evaluation in patients with dysphonia. Stroboscopic visualization of the larynx during phonatory tasks provides a representation of the mucosal wave as well as a high resolution image of the laryngeal architecture. The videostroboscopic examination should include visualization of the larynx during inhalation, cough, sustained vowel (/i/), and sustained vowel with varying degrees of loudness. Both structural and functional abnormalities are assessed during review on permanent media after recording. Go to Stroboscopy for a detailed discussion of this important diagnostic tool. Additional laryngeal analysis, including acoustic, aerodynamic analysis, high-speed digital imaging, and kymography may be indicated in certain cases. Patients who have had dysphonia due to vocal fold paralysis for less than 6 months are candidates for vocal fold injection thyroplasty (unless the nerve is known to have been cut, in which case medialization thyroplasty may be performed at any time). Historically, many materials, including fat, Teflon, Gelfoam, calcium hydroxylapatite, collagen, and hyaluronic acid have been used as injection material. Teflon has fallen out of favor because of granuloma formation and is no longer available. All of these materials (except calcium hydroxylapatite) undergo resorption and therefore require initial overinjection. Medialization thyroplasty and arytenoid repositioning procedures are indicated in patients whose paralysis lasts 12 months or more or for patients with no evidence of electrical recovery on electromyography (EMG) after 6 months. Go to Vocal Fold Paralysis, Unilateral for more detailed information on these procedures. Merati AL, Bielamowicz AS. Textbook of Laryngology. San Diego, Calif: Plural Publishing, Inc; 2007. Negus, VE. The Comparative Anatomy and Physiology of the Larynx. London: Heinemann; 1949. Pikus L, Levine MS, Yang YX, Rubesin SE, Katzka DA, Laufer I, et al. Videofluoroscopic studies of swallowing dysfunction and the relative risk of pneumonia. AJR Am J Roentgenol. 2003 Jun. 180(6):1613-6. [Medline]. Nomura S, Mizuno N. Central distribution of efferent and afferent components of the cervical branches of the vagus nerve. A HRP study in the cat. Anat Embryol (Berl). 1983. 166(1):1-18. [Medline]. Migueis A, Ucelay I, Migueis J, Urtasun A, Traissac L. [Galen's anastomosis, an anatomic study in man]. Rev Laryngol Otol Rhinol (Bord). 1989. 110(4):423-5. [Medline]. Harding R, Johnson P, Johnston BE, McClelland MF, Wilkinson AR. Proceedings: Cardiovascular changes in new-born lambs during apnoea induced by stimulation of laryngeal receptors with water. J Physiol. 1976 Mar. 256(1):35P-36P. [Medline]. Sasaki, CT. Anatomy and development and physiology of the larynx. GI Motility Online. 2006. [Full Text]. Jürgens U. Projections from the cortical larynx area in the squirrel monkey. Exp Brain Res. 1976 Jun 30. 25(4):401-11. [Medline]. Brown S, Ngan E, Liotti M. A larynx area in the human motor cortex. Cereb Cortex. Apr 2008. 4:837-845. [Medline]. Gacek RR, Malmgren LT. Laryngeal motor innervation - central. Blitzer A, Brin MF, Sasaki CT, Fahn S, Harris KS, eds. Neurological Disorders of the Larynx. New York, NY: Thieme Medical Publishers; 1992. 29-35. Addington WR, Stephens RE, Widdicombe JG, Rekab K. Effect of stroke location on the laryngeal cough reflex and pneumonia risk. Cough. 2005 Aug 4. 1:4. [Medline]. [Full Text]. Power ML, Hamdy S, Singh S, Tyrrell PJ, Turnbull I, Thompson DG. Deglutitive laryngeal closure in stroke patients. J Neurol Neurosurg Psychiatry. 2007 Feb. 78(2):141-6. [Medline]. [Full Text]. Ishibashi A, Fujishima I. Lesion of the nucleus solitarius leads to impaired laryngeal sensation in bulbar palsy patients. J Stroke Cerebrovasc Dis. 2012 Apr. 21(3):174-80. [Medline]. Merati AL, Halum SL, Smith TL. Diagnostic testing for vocal fold paralysis: survey of practice and evidence-based medicine review. Laryngoscope. 2006 Sep. 116(9):1539-52. [Medline]. Horner J, Massey EW. Silent aspiration following stroke. Neurology. 1988 Feb. 38(2):317-9. [Medline]. Smith Hammond C. Cough and aspiration of food and liquids due to oral pharyngeal Dysphagia. Lung. 2008. 186 Suppl 1:S35-40. [Medline]. Ramsey D, Smithard D, Kalra L. Silent aspiration: what do we know?. Dysphagia. 2005 Summer. 20(3):218-25. [Medline]. [Guideline] Smith Hammond CA, Goldstein LB. Cough and aspiration of food and liquids due to oral-pharyngeal dysphagia: ACCP evidence-based clinical practice guidelines. Chest. 2006 Jan. 129(1 Suppl):154S-168S. [Medline]. Brin MF, Fahn S, Blitzer A, Ramig LO. Movement disorders of the larynx. Blitzer A, Brin MF, Sasaki CT, Fahn S, Harris KS, eds. Neurological Disorders of the Larynx. New York, NY: Thieme Medical Publishers; 1992. Zhao JN, Liu Y, Li HC. Aspiration-related acute respiratory distress syndrome in acute stroke patient. PLoS One. 2015. 10 (3):e0118682. [Medline]. Seo HG, Oh BM, Han TR. Swallowing Kinematics and Factors Associated with Laryngeal Penetration and Aspiration in Stroke Survivors with Dysphagia. Dysphagia. 2016 Apr. 31 (2):160-8. [Medline]. Onofri SM, Cola PC, Berti LC, da Silva RG, Dantas RO. Correlation between laryngeal sensitivity and penetration/aspiration after stroke. Dysphagia. 2014 Apr. 29 (2):256-61. [Medline]. Zhang J, Zhou Y, Wei N, et al. Laryngeal Elevation Velocity and Aspiration in Acute Ischemic Stroke Patients. PLoS One. 2016. 11 (9):e0162257. [Medline]. [Full Text]. Kojima A, Imoto Y, Osawa Y, Fujieda S. Predictor of rehabilitation outcome for dysphagia. Auris Nasus Larynx. 2014 Jun. 41 (3):294-8. [Medline]. Radhakrishnan S, Menon UK, Anandakuttan A. A combined approach of bedside clinical examination and flexible endoscopic evaluation of swallowing in poststroke dysphagia: A pilot study. Ann Indian Acad Neurol. 2013 Jul. 16(3):388-93. [Medline]. [Full Text]. Freed ML, Freed L, Chatburn RL, Christian M. Electrical stimulation for swallowing disorders caused by stroke. Respir Care. 2001 May. 46(5):466-74. [Medline]. Park JW, Kim Y, Oh JC, Lee HJ. Effortful swallowing training combined with electrical stimulation in post-stroke dysphagia: a randomized controlled study. Dysphagia. 2012 Dec. 27(4):521-7. [Medline]. Arai T, Yasuda Y, Takaya T, Toshima S, Kashiki Y, Yoshimi N, et al. ACE inhibitors and symptomless dysphagia. Lancet. 1998 Jul 11. 352(9122):115-6. [Medline]. Woodson GE, Blitzer A. Otolaryngology head and neck surgery. Cummings CW, Flint PW, Harker LA, et al, eds. Neurologic Evaluation of the Larynx and the Pharynx. 4th ed. Philadelphia, Pa: Mosby; 2005. 2054-64. Flint PW, Purcell LL, Cummings CW. Pathophysiology and indications for medialization thyroplasty in patients with dysphagia and aspiration. Otolaryngol Head Neck Surg. 1997 Mar. 116(3):349-54. [Medline]. Broniatowski M, Moore NZ, Grundfest-Broniatowski S, et al. Paced glottic closure for controlling aspiration pneumonia in patients with neurologic deficits of various causes. Ann Otol Rhinol Laryngol. 2010 Mar. 119(3):141-9. [Medline]. Sulica L, Blitzer A, eds. Vocal Fold Paralysis. Heidelberg, Germany: Springer; 2005. Venketasubramanian N, Seshadri R, Chee N. Vocal cord paresis in acute ischemic stroke. Cerebrovasc Dis. 1999 May-Jun. 9(3):157-62. [Medline]. Jung SJ, Kim DY, Kim YW, Koh YW, Joo SY, Kim ES. Effect of decannulation on pharyngeal and laryngeal movement in post-stroke tracheostomized patients. Ann Rehabil Med. 2012 Jun. 36(3):356-64. [Medline]. [Full Text]. Blitzer A, Crumley RL, Dailey SH, et al. Recommendations of the Neurolaryngology Study Group on laryngeal electromyography. Otolaryngol Head Neck Surg. 2009 Jun. 140(6):782-793. [Medline]. [Full Text]. Illustration of the glottic and supraglottic larynx. 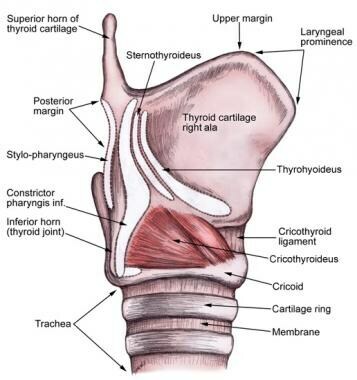 Illustration of the larynx, nasopharyngeal view.